Please find below instructions on how to take measurements. 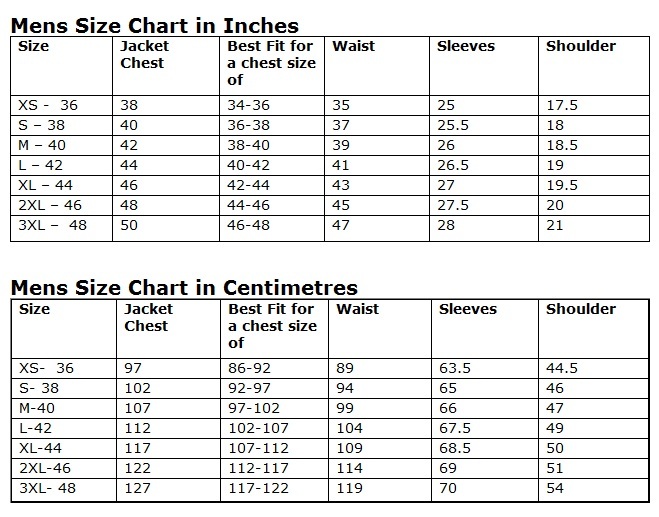 After taking the measurments, please compare them with the size chart given for the leather jacket. Please note these are generic measurements and may vary dependant on the style ordered. Please contact us for further details. Length: Choosing your own length, start from the back of the neck and measure down to where you wish. Shoulder: Horizontally across the back, measure from one tip of the shoulder to the other. It is important to note whether you wish to have a loose fitted or tight fitted jacket. For loose fitted jackets we normally add around 3 inches to the waist and chest and for tight fitted jackets we add around 2 inches. The rest of your measurements will remain the same. Regular fitted jacket we suggest adding 3-4inches to the chest and waist measurements. Tight fitted jacket we suggest adding 2 inches to the chest and waist measurements. Any waist and thigh measurement can be combined to achieve a perfect fit. For example an XS waist and a M thigh is a common size for women, and a L waist and an XL thigh is a common size for a male weight lifter. With your jeans on measure around the thickest part of your thigh while sitting. Your waist measurement is typically your jean’s waist size with 2 inches added. This provides enough room for your chaps to fit over your jeans and possibly a belt. With your riding boots on measure from the top of your belt to the floor along the outside of your leg. It is common for chaps to be an inch or more too long. We trim chaps to the correct length when we fit people in our store, however you may do the same yourself . Trim only enough material to keep your chaps from draging on the floor, remember you can always trim a little more off later but you can’t put any back on.